Here it is, the all-new 2018 Nissan Leaf. The second-generation Leaf is being billed as “the world’s most advanced mass-market electric vehicle” and an icon of the company’s Intelligent Mobility vision. In case you didn’t know, Teslas aren’t mass market and the Leaf was a pioneer and major gamble on Nissan’s part back in 2010 when electric cars weren’t in vogue. 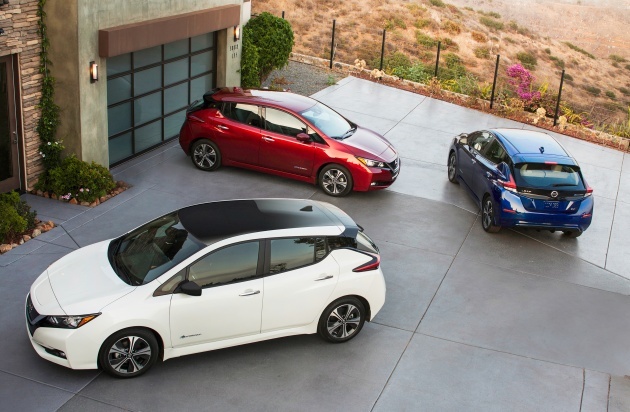 The new Leaf combines a greater range with a dynamic new design and fresh technologies. At the heart of it is the Leaf’s e-powertrain that offers improved energy efficiency and increased power and torque output, which now stand at 110 kW (148 hp) and 320 Nm. That’s an improvement of 38% and 26%, respectively. Powering the EM57 e-motor is a 40 kWh lithium-ion battery pack. In 2016, the original Leaf received a battery upgrade from 24 to 30 kWh, so this is a big step forward while maintaining battery pack dimensions. Compared to the original 2010 Leaf, the battery here has 67% better energy density. The enhanced electrode materials with revised chemistry, besides contributing to power density, also improves durability upon charge and discharge. However, the Chevrolet Bolt has a 60 kWh battery, while the Tesla Model 3 is said to have a battery with energy capacity of up to 80 kWh. 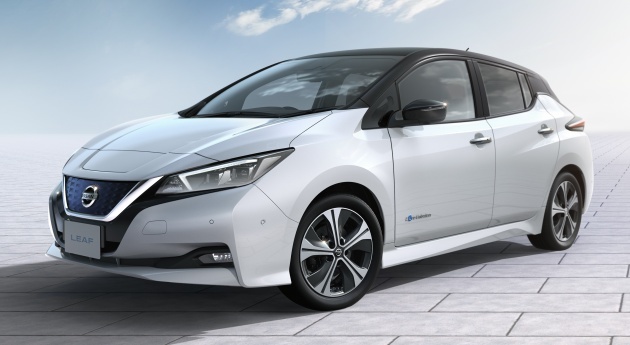 The Leaf’s 40 kWh battery is good for a driving range of 400 km in Japan’s cycle and 378 km in the New European Driving Cycle (NEDC) on a single charge. In the US, the EV’s projected EPA range is 241 km (150 miles). Nissan says that it will introduce a “high-power version” of the Leaf with increased motor power and battery capacity at the end of 2018. This version will provide a longer range, at a higher price, of course. As for charging time, Nissan quotes eight hours pulling from a 6 kW source, and double that time from a 3 kW source. There’s also quick charging up to 80% that takes 40 minutes via the CHAdeMO charging socket. The max AC charge rate is 6.6 kW, or 50 kW with DC quick charge. In countries where vehicle-to-home systems exist, the battery makes it possible to store surplus solar power during the day and then use it to help power the home in the evening. One can also recharge the battery in the middle of the night, when prices are lowest in some markets, and then use the electricity during the day to reduce energy costs. In places with vehicle-to-grid systems, Leaf owners can get incentives from energy companies to improve power grid stability by absorbing demand fluctuation. To match the improved output, Nissan enhanced the car’s chassis for better stability. Heavy components including the battery are placed in the centre of the body, helping achieve smaller yaw moments of inertia compared with vehicles with an engine in front. Nissan says that the new Leaf’s EPS has a more linear feel and improved feedback from the road surface. Also, the urethane bump stop for the rear suspension has been replaced by a rubber one for a smoother ride. The Intelligent Ride Control software manages torque generation when cornering, to reduce vibration and improve ride quality. EVs are quiet things, but the lack of an engine makes wind noise obvious. Nissan says that aerodynamic upgrades (reduced drag and zero lift, Cd 0.28) and exterior refinements have led to a reduction in wind noise in the new Leaf. Other noise-reduction measures include optimisation of the redesigned inverter’s structural rigidity, and a noise-isolating cover on top of the power delivery module. The noise from the e-motor itself has also been reduced. 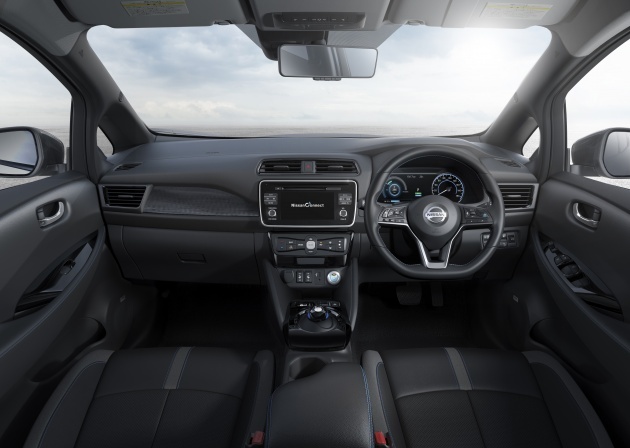 Nissan is very proud of its “Intelligent Driving” technology in the new Leaf, headlined by ProPILOT, ProPILOT Park and the e-Pedal. ProPILOT is a single-lane autonomous driving tech. Once activated, the Leaf can automatically control the distance to the vehicle in front using a speed preset by the driver (between 30 km/h and 100 km/h), while steering and keeping itself centered in its lane. It does braking to a complete stop too, remaining there till without the driver’s foot on the brakes. To reactivate the system, the driver just needs to touch the switch again or lightly press on the throttle. ProPILOT Park combines image processing technology using four cameras and information from 12 ultrasonic sensors around the car to help one park the car automatically. Searching for a spot, acceleration, brakes, handling, shift changing and parking brakes are all automated. Also new is the e-Pedal, which provides the simplicity of starting, accelerating, decelerating, stopping and holding the car by using the accelerator pedal alone. To slow down the car in one-pedal driving, just release the accelerator. There’s also no need to step on the brakes at a standstill; just holding your right foot’s position is fine. With a deceleration rate of up to 0.2 g, the e-Pedal eliminates the need for drivers to constantly shift their foot from the accelerator to the brakes. A brake pedal is still provided, and must be used in “aggressive braking situations” but the e-Pedal is good for more than 90% of driving needs, Nissan says. Sounds strange, but this is something that has to be experienced. “Drivers of the new Nissan Leaf will quickly come to love the e-Pedal, as it makes the usual experience of urban driving far smoother and more fluid, and less demanding. Our testing has showed that drivers quickly find the e-Pedal intuitive and even enjoyable. It promotes anticipation on the road, which in turn has a positive effect on driving pleasure,” assures chief vehicle engineer Hiroki Isobe. On the active safety front, Nissan’s Safety Shield includes Intelligent Lane Intervention, Lane Departure Warning, Intelligent Emergency Braking, Blind Spot Warning, Traffic Sign Recognition, Rear Cross Traffic Alert, Intelligent Around View Monitor with moving object detection and Emergency Assist for Pedal Misapplication. If the original Leaf looked a like a cartoon character, this new one looks a lot more like a normal car. Inspired by the IDS Concept from Tokyo 2015 and sharing a design language with the cool new B-segment March, the Leaf appears significantly more dynamic, a little sporty even. The cues also seen on the March include the signature V-Motion grille, the “boomerang” light signature and the floating roof. A clear-blue 3D mesh pattern with a “freezing” motif, on a flush surface inside the V-Motion grille, marks the Leaf out as an EV. The new 45-degree angle of the charging port at the front has been reconfigured for greater convenience, allowing the user to connect the charging cable without bending down. Inside, the Leaf’s cabin isn’t very radical but it looks smart. Using the “Gliding Wing” framework, the cockpit focuses on visibility, spaciousness and functionality. Blue can be found on the stitching, illuminated power switch and shift knob finisher; and there’s a start-up movie to welcome the driver. The meter panel combines an analogue speedometer and a seven-inch colour multi-info display. The centre display has a screen with a flush-surface design. It shows the Safety Shield tech, the Leaf’s state of charge and a power gauge, as well as audio and navigation info. There’s a smartphone app that allows users to monitor the car’s state of charge, schedule charging, find the nearest charging station, and pre-heat or cool the car before getting in. The Leaf has always been a spacious C-segment hatchback, and the new one gets a redesigned boot for an improved 435-litre capacity. The boot can now take in two large suitcases or three medium-sized, airline carry-on cases. 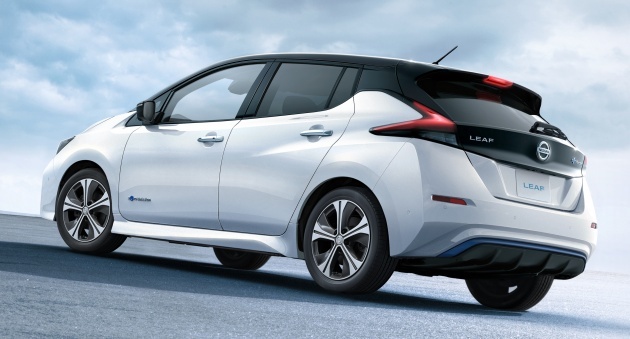 The new Nissan Leaf goes on sale in Japan in October, priced from 3,150,360 yen (RM123,222). The EV is slated for deliveries in January 2018 in North America and Europe. I have that same preference for a standard Almera but not those with the Nismo body kit. Impulse bodykit still looks a little off for me. simple nice… hopefully not high price. I belief the leaf is an “A” segment car..
Now it looks much better than the previous katak face.. interior is so much easy to adapt compare to tesla model 3.. This is a major improvement over the original, from 160km to 400km. I’m sure in real life driving you probably get around 350km but that is enough for me. The car also looks much better than Prius. However I think if they sell it here the price might be around rm150k. interior looks like current CRV.. kek! CKD this and make it affordable to Malaysians.. oh wai- just realize our Nissan here controlled by Tan Chong..
Any idea ETCM bringing this in to replace the old one? Price should be cheaper since it’s USD 690 cheaper than the old one. e-pedal? good idea Nissan but i do hope one thing though, all Leaf drivers then do not go back to driving conventional cars because “intuitively” they may forgot that they still need to apply the brakes to slowdown or stop!!! Dont think the savings in petrol cost for 10yrs is ever going to offset the cost of vehicle + TNB bill. 40kWh is just RM20 (considering you use up till 3rd block of TNB tariff together with your home appliances) and it takes you 400km..
assuming you travel 1200 per month, thats RM14,400 saving in 10 years..
You are not only saving on fuel $$, you are also saving mother earth for your children, grandchildren and great grandchildren.